Over the past several decades, the civil justice process has become alarmingly expensive, politicized, and lengthy. Though the court system lies at the heart of American democracy, it often does not meet the legitimate needs of the people, resulting in a rift between citizens and their own legal system. With a system that hasn't seen major reform since 1938, it's inevitable that there are shortcomings and misunderstandings. The situation is precarious, but not hopeless. In Rebuilding Justice, Rebecca Love Kourlis and Dirk Olin illuminate why the courts are critical and how they are being eroded, defaced, and undermined. 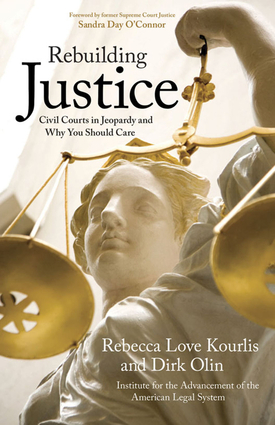 While covering complex issues such as civil justice reform, judicial selection and performance evaluation, and domestic relations, Kourlis and Olin propose practical solutions to improve the efficiency, accessibility, and integrity of America's civil courts. An important portrait of the American judicial system, Rebuilding Justice is a call to action for all Americans to take the steps necessary to fix, support, and protect this crucial cornerstone of our democracy. Dirk Olin is the Editor & Publisher of Corporate Responsibility Magazine and a fellow with the Institute for the Advancement of the American Legal System. He is currently Board President of the Soros Foundation's International Debate Education Association. He lives in Maplewood, NJ. Rebecca Love Kourlis is the Executive Director of the Institute for the Advancement of the American Legal System at the University of Denver. She served for 11 years as a Justice of the Colorado Supreme Court, and 8 years as a trial court judge in North Western Colorado. She lives in Colorado.